The team of 9 are now in Bungoma, 6 staying in the Bungoma Tourist Hotel and 3 staying at the orphanage in Kipcheria. Tomorrow the work begins with a clergy retreat day and the teachers in St Dorcas School. Today has been an orientation day and we have all been to Beatrice's shop, 2 supermarkets and a book shop where we bought our writing material suppliers and 10 Bibles in Kiswahili. Surprisingly no stiffness after my walk on Wednesday. Looking forward to tomorrow when it is Fitbit Goal day and easily surpassing my 10,000 step goal. I have already planned my next walk for next week which will take in Roots coffee shop, (no cakes only coffee as I need to loose a little bit of weight before the Lyke Wake), part of the Coast to Coast and may even call in at Osmotherley again. I was talked into doing the Lyke Wake Walk by my daughter as she wanted to do it and so I agreed to do it to raise some funds to take out to Bungoma when we go out on mission there in October this year. The walk is forty (40) miles and has to be completed in 24 hours, so I have started my training. Today I walked from Ingleby Arncliffe over to Osmotherley and back again. Six miles at 3 miles per hour pace. I will certainly have to up the mileage with only 72 days to go until I start the walk. Our short mission to the Arise and Shine church and the Anglo Church of Kenya is coming to an end. Three intrepid missionaries flew out to Kenya on 24th May arriving in Bungoma County the following day. Our driver Albert picked us up from the airport and drove us to the St Dorcas Orphanage in Kipcheria where we were staying. This short mission had two objectives. The first to visit the orphanage and to see how that was progressing and to see how the new property was fairing under the constant use of having now thirty children using it. The second was to deliver eight days of seminars to two local churches, the Arise and Shine Church and the (New) Anglo Church of Kenya. The seminars went well with plenty of people attending and good participation. The adult learning techniques we used are different from what they are use to making harder work for the presenters than it would be in the UK. The quality of some of the answers and discussion back in the plenary sessions though was generally very good. The orphanage is moving from strength to strength. There are now thirty children in the orphanage, 15 girls and 15 boys. Each one of them goes to school in the local area to the orphanage. The new dining room and kitchen, plus the security house are a great addition to the site. The orphanage itself is now over a year old and some minor remedial work was required to the building. All this was carried out during our stay there. With rain water harvesting, solar panels generating electricity and the composting of waste vegetable matter the orphanage is also 'green' and sustainable in the use of resources. In several areas it is trying to be self sufficient and has gone a long way to achieving that. All in all it was and excellent, though very busy, trip. Just given my first talk on Bungoma Calling for some time. It was to the Brompton Mother's Union who had invited the Northallerton MU to join them. After a short service I gave a talk lasting nearly 1 hour on what Bungoma Calling is doing in Kenya and the two Encounter visits I have been on. The audience were very receptive and several gave donations and many bought some of the pens, necklaces and cards that I had. A good evening and a good way of spreading the message of what we are all about. 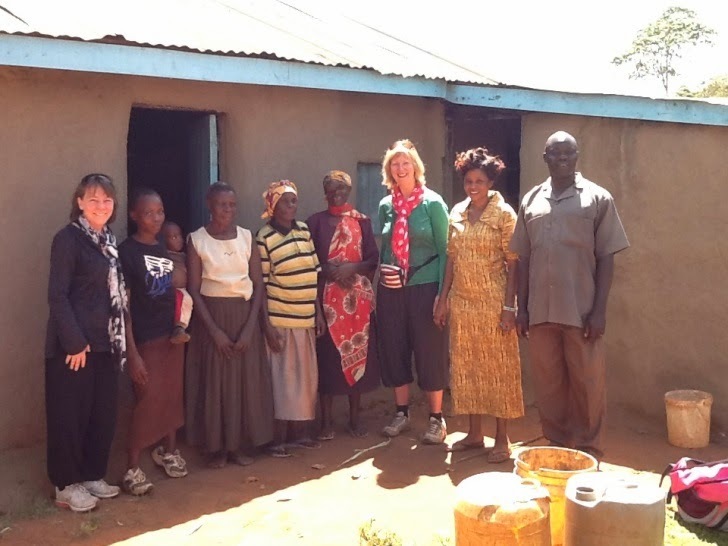 Last month we told you about our visit to the Orphanage near Bungoma in March this year. We thought you would also like to share what we did for another part of our visit – delivering food parcels to the local elderly people. 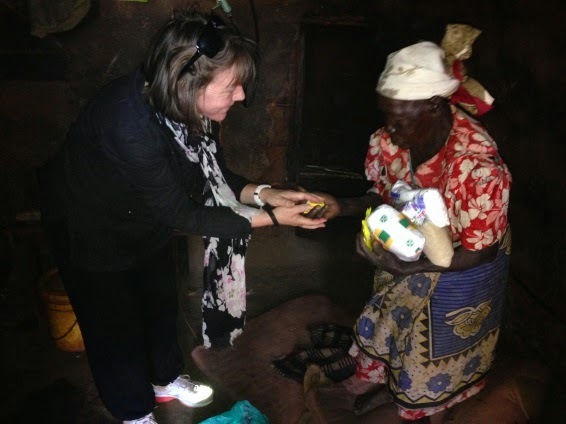 The area we visit is extremely remote and therefore the people living in Kipcheria, where we stay, as well as the surrounding villages, live in extreme poverty. They live in a small square space – probably about 12 foot square, half of which they sleep in and the other half they live and cook in. These people mainly rely on growing their food to live and all have to walk to the nearest water point each day and carry their supply back to their houses. We made up 80 parcels and handed out around half of these during our stay. The rest were to be taken to churches within the Rise & Shine church group for the elderly people in their congregation. The Rise & Shine church also oversees the Orphanage where we stayed and visited. We handed each part of the food parcel separately to each of the people we visited. At the end of each delivery we prayed together both for each other and also for having the opportunity to meet these very special people. Their gratitude was overwhelming for us. One man we visited was extremely poorly, he was dying of Aids. This is only the second time we have met someone having to deal with this disease. What was particularly sad is that he has an 8 year old son, Carlos, and the father is the only carer available. Since our visit things have moved on.The Orphanage received a request for Carlos to be taken into their care; this has now happened. We are sure this will be a huge relief to his father as he deals with his own illness and problems. 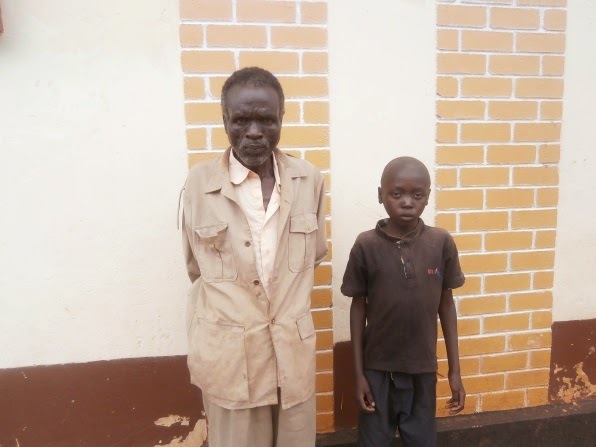 Here is a somewhat sad photo of them both arriving at the Orphanage. The charity has released funds so that Carlos can have a school uniform (like the other children) including shoes. Once again our visit to these elderly people shows how fortunate we are for ready access to all our food resources.